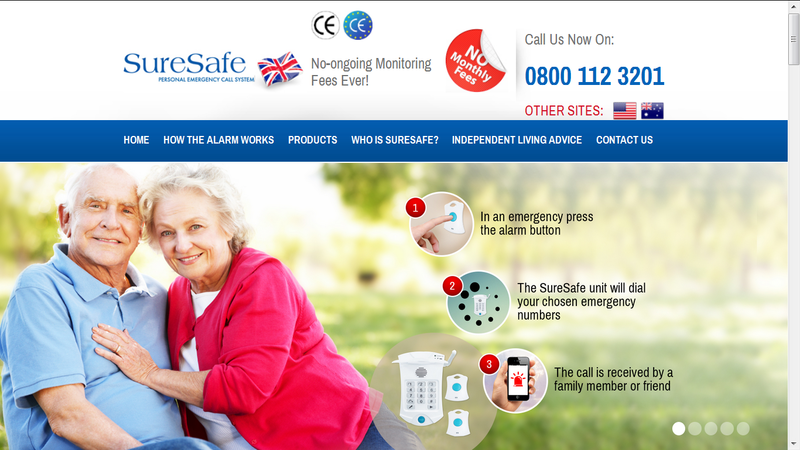 Based in Wirral, England, SureSafe Alarms expertise as leaders in telecare and assistive technology for the United Kingdom based senior citizens by offering them personal alarm systems at competitive prices. At SureSafe Alarms, we aspire to help our clients make informed choices, with advice on the products most suitable to their needs and circumstances. Senior citizens want to lead independent lives post retirement but need to be mindful of safety and security as health deteriorates. Designed to improve their quality of life, as well as making them safer, SureSafe Alarms offers a range of personal alarms systems at prices to fit every need and budget. The Wirral, England based leading provider of innovative and highly practical telecare and assistive technology solutions caters to the safety related requirements of its clients in the United Kingdom. The personal alarm systems offered by SureSafe Alarms are proving to be very popular in the UK for their quality features, specifications, and benefits. SureSafe Personal Alarm System connects senior citizens to the emergency services, their family members and friends, aside from being a 24/7 connection to the outside world and to help in the event of an emergency. The personal alarm system has proved to be an big hit among elderly Britons and their families as they offer both safety for the wearer and peace of mind for their loved ones. Promising perfect peace of mind, safety, and security, the range of personal alarms on offer include a monitored care line system and non-monitored systems that call family, friends and neighbours directly. One SureSafe alarm, with no monthly monitoring fees and plug-and-go functionality, the SureSafe Personal Alarm System enjoys the patronage of thousands of satisfied customers. Accordingly, for those looking to buy personal alarm, prefer the products and services of SureSafe Alarms. SureSafe Alarms, the Wirral, England based provider of telecare and assistive technology solutions, prides itself in its reputation of being a reliable aide to senior citizens looking to independently in their own homes, safer and for longer. Committed to promote independent living among elderly British populace, the company ensures a constant supply of panic alarm systems at genuinely affordable prices. SureSafe Alarms strives to be good corporate citizens and gives back to the community that it serves. It supports several philanthropic organisations in the UK, in addition to making independent living affordable for all now that all senior citizens could buy elderly alarm. Accordingly, for those looking for personal safety alarms in the United Kingdom, it has become a first choice provider and offers a high quality and affordable one-stop-shop solution.